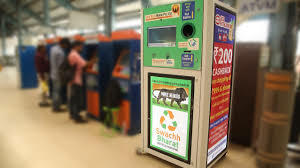 A Swachh Bharat Recycling Machine (PET Bottle Recycler Machine) has been installed at Platform No 1 of Thiruvananthapuram Central Railway station. The machine will shred plastic bottles into recyclable granules through the reverse vending process. It has a processing capacity of 500 PET bottles per day and storage capacity of 5000 shredded PET bottles. The PBR Machine is an innovative step for primary treatment of plastic waste by Swaniti Initiative of SPARC program with the Railways materialized by the CSR funding of Jubilant Foodworks Ltd. in partnership with Wild West Innovations.